After all the lot search committee efforts that gave us a new lot, and a test event that showed it can be a long term success with lower costs, better surface, ability to schedule a full year at a time, etc., the solo committee did not seek or schedule any dates at CSUSM in 2019, per the schedule presented and approved at last night’s meeting. Qualcomm lot conditions are poor and the lot will be gone sooner rather than later. What happened? What is the logic? Why did the committee throw away all the hard work and the opportunity for sustaining the program at a new site? Last edited by cpasti; 12-05-2018 at 11:51 AM. And some people wonder why I, and many others, walked away from SDR. The Committee at the Solo Meeting last night asked Robbie to look for a date in May at CSUSM, so there's no intent as Peter implied to have NO CSUSM events or "throw away" anyone's hard work. The schedule we have, as proposed, is all SDCCU events because that's what Warren bid for at his meeting with them. We approved the schedule, but changes can (and are almost always) made, by us or outside entities. What the rest of the Committee can do to supplement/replace our dates are forthcoming. 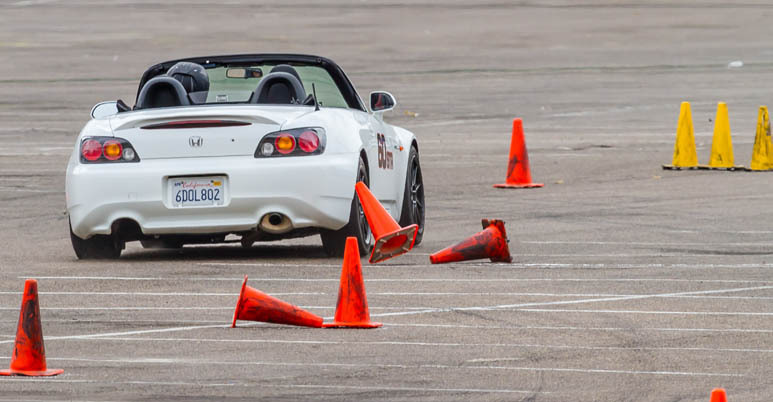 I personally enjoy going to SDCCU to autocross, but I am very hopeful that we will find dates for CSUSM as well, and we can supplement/replace, as desired, so that we can maintain long-term thinking. We’ve had months to book out as far as the end of 2019 with CSUSM and there was no need to wait for the stadium meeting. Yet we asked for nothing to date, and therefore booked nothing to date, and haven’t posted anything for the last half of the year when we could have. Hopefully the issue of the stadium going away and in the meantime also becoming less reliable and in deteriorating condition is taken seriously. This was our opportunity to start to make a move, and we sat on our hands. Agree it doesn’t mean it’s gone for good, but there is hardly a push to schedule dates and no one is driving it. Asking for one weekend in May, and only because there wasn’t a stadium date in May, is not pursuing use of the lot proactively. So I’ll stand by my assessment of what we’ve done and not done, as stated above, with the availability of CSUSM. As with any issues of timing, there will always be dissenting opinion on what is short-sighted thinking, and what is alarmist. Our Committee has talked about getting access to a new site because of the Q's imminent disappearance as a viable location since I began around 2011. If we had locked down CSUSM in 2015, would the push to "grab the new site now and dedicate dates to it because who knows when the Q will go?" seem as necessarily prudent? In hindsight, we have had full schedules, even with the drops and deteriorating condition, up until 2018, and 2019 looks okay too. Were the people in 2011 alarmist? Are the people in 2018 alarmist? I have no idea. I like the idea of prudence, but I think a better idea is to find a middle ground, and slowly ramp up more and more events. If we had 1 this year, have 4 next year, and then 8+ the next, we can also be successful. Since we often like to use CSCC as an example, they've seemed relatively successful transferring from favoring El Toro (and filling with Fontana like we want to with CSUSM) to now only doing Fontana. I'm not sure Fontana cares they've always been second choice to El Toro, so long as checks keep getting signed. Likewise, I'm unsure why CSUSM would be bitter or pout because we didn't schedule enough events with them. Even if coordinators like Chris leave, we have documentation of what we've done. As we transition to more events there, I'm sure our money will be just as attractive as well as the (possibly) positive selling-point to their incoming/current students of having such a car club available. Yes, it would have been prudent in 2015, even before to have scheduled events other than the stadium. Neither alarmist nor short sighted, but forward thinking and leading. We have looked for years, without success, until now. All those years, the reason to look was to have options and more than one site. We now have two, but are only scheduled to use one. CSCC, like many regions that use multiple sites, is a good example. They developed both sites, and have even used others before. They keep them in rotation, they keep engaged. CSUSM won’t pout or be upset if we never held another event, they have no reason to, but we might. We have a program to potentially lose, they have nothing to lose. I wouldn’t assume becuase we held one event at CSUSM means they’ll be happy to have us back, or that we would get any priority, if and when we the try to, vs. maintaining an ongoing relationship. In this case that means being there, renting the lot, regularly engaging with their staff, becoming part of their operations as well as ours. We will all have differing opinions, mine is that we seem to have regressed to apathy about a new site. FWIW, and I'm not at all involved in any committees, I think we should have "something" at CSUSM, what's the downside? I ran there, it was short but fine. Maybe a test & tune type event, engage the CSUSM follks, give rides, whatever. What's the harm? Two years on a rotting (big) lot is going to go by fast. I was taking chunks on the starting line (as starter run group 3) because a hole down to the dirt was opening up. Thanks Jeff, for brooming it. Good man. - El Toro became the preferred site, but event's were maintained at AAA Speedway, to keep the foot in the door, even though they are a race track, and would still be there. - But, Norton would be a better comparison. Norton closed for our use for a few years due to increased FAA restrictions, eventually building on that lot. BUT!!! They built a new lot, however it was smaller. I worked very hard to open a new relationship w/ the new management that came in the ensuing years, and put on a "test" event. We were offered a sweetheart of a deal, for $10k per year, the lot was exclusively ours, and we could sublease it out to other car clubs on weekend we didn't want to use it. Smarter people than me decided that El Toro was the be all end all of lots in the country, & with AAA Speedway as a backup, Norton being smaller than either of the other two was deemed to be unneeded. El Toro is now gone, management has changed again at Norton (San Bernardino International Airport), the lot has been put to other uses (Semi trailer storage), and is no longer available to us. Cal Club now has one lot. Last edited by CNaylor; 02-06-2019 at 07:02 PM.